In this “how to” I’ll be covering the basic construction of underwear with this turquoise and brown specimen below as a sample. Next underwear-post will cover some other alternatives for adding elastic, including fold-over (FO) elastic, and the bare-bones regular kind of elastic. regular elastic, or specialized underwear elastic such as fold-on elastic (I’ve had very good experience with this company). The amount will depend on the size of the underwear, but roughly 2 yards pr piece of underwear? 1. Cut out all patternpieces, making sure to stay on grain. Often in t-shirt material there is a distinct horizontal or vertical orientation – line up your pattern pieces with that, not the side-seams or hems if they seem very off. Because of how t-shirt material is often made (knit in the round), the material is often off-grain when sewn up to a garment, and that my friends is why t-shirts twist and the side-seams aren’t at your sides anymore! Digressing aside, you need one front, one back, and two gusset pieces. For this sample I took advantage of the existing bottom hem, and lined up the top of back and front pieces with the hem. 2. Sandwich the front piece between two gusset pieces along the shorter gusset edge, and sew. Make sure that both gusset pieces are facing right sides towards front piece. Front and gusset pieces sewn. 3. 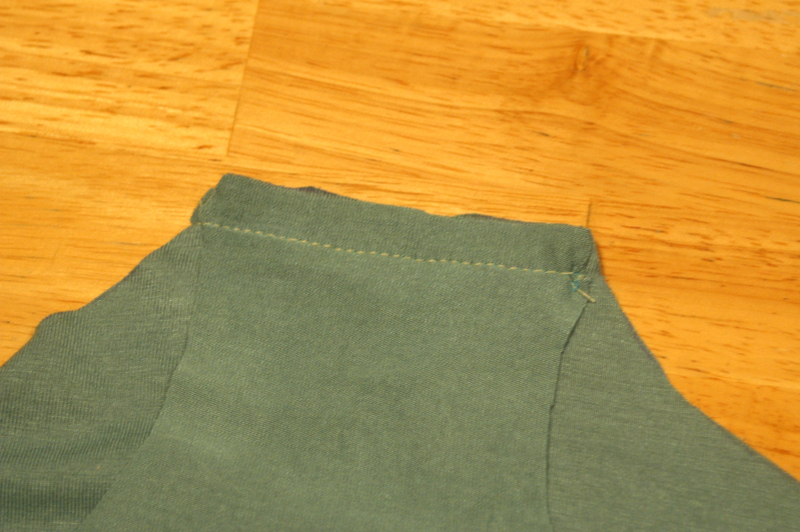 Roll up the front and back piece *into* the gussets, and line up the longer gusset edge and sew. Contorting the pieces for an enclosed gusset. Not looking too bizarre now. And I’ve done the elastic in the casing already at this point, which really can be done at any time before sewing the side-seams. 5. Taking advantage of the existing hem, thread elastic through the casing the hem creates. 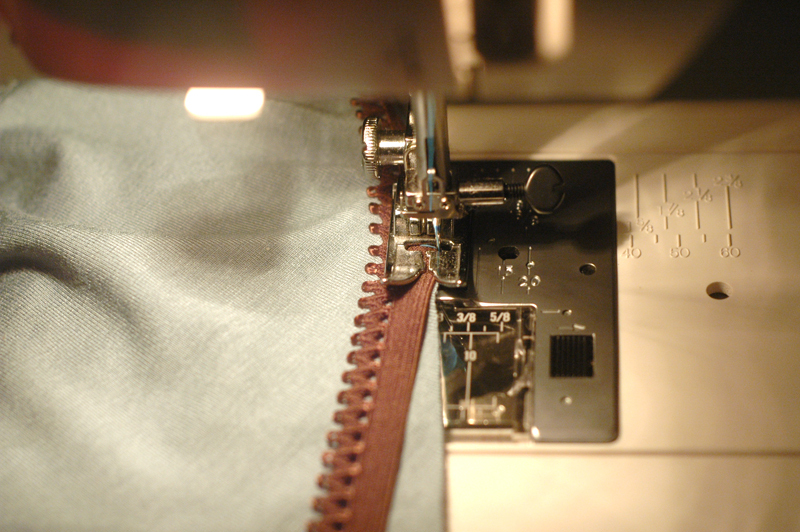 Zig-zag or backstitch the elastic inside the seam-allowance of one side. 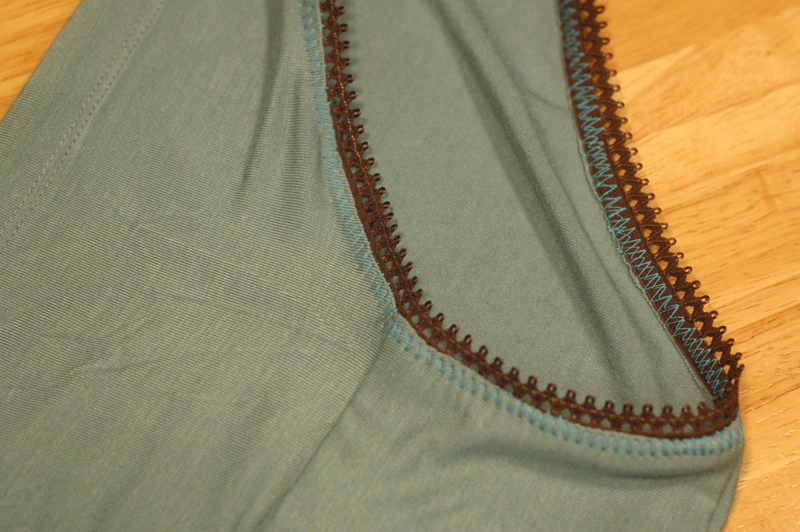 Pull the other end of the elastic slightly to ensure a snug fit, and sew down on opposite side of the casing/hem. 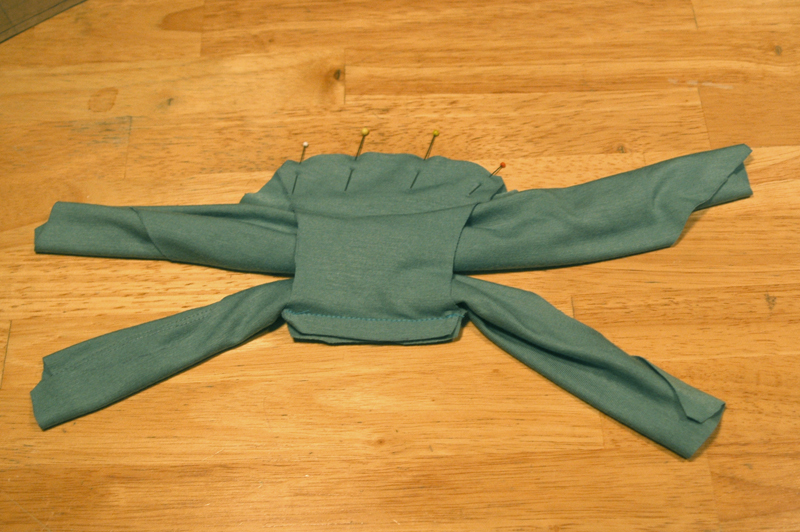 Cut off the excess elastic, and do this for both front and back pieces. Note! When adding elastic in another way, skip this step entirely. 6. Sew the side seams. 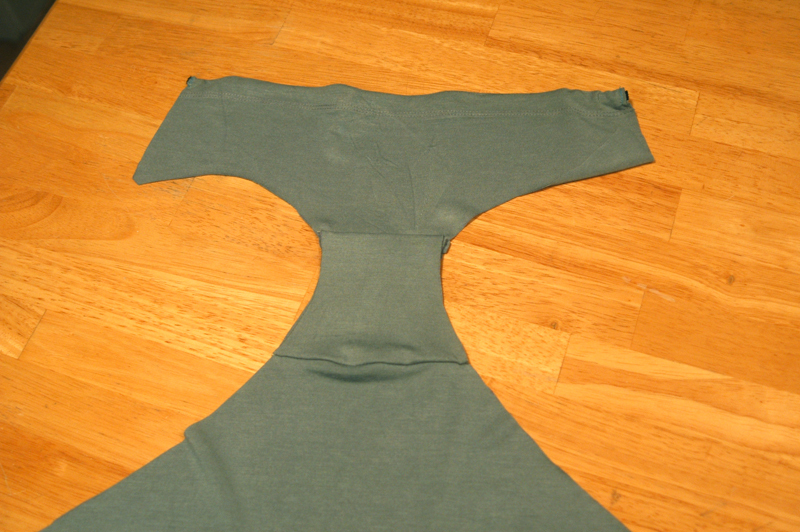 Consider finishing the side seam with a flat-felled seam, mock flat-felled seam, or topstitch the seam-allowance down on either side of the seam. These are mostly decorative, and therefore quite optional! 7. It’s time for the elastic! I’ve used some picot edge elastic for the leghole. Line up the non-decorative edge along the edge of the leghole with the right side of the underwear up. Zig-zag using a fairly wide stitch, but not wider than the plain part of the elastic. 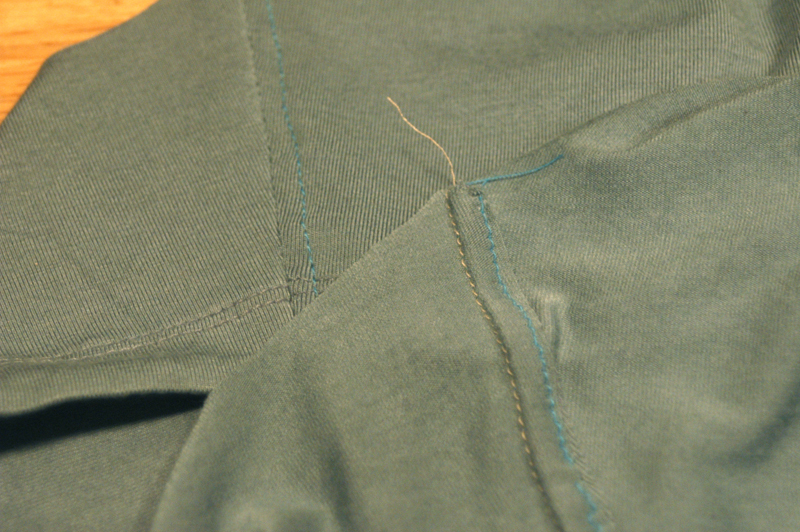 I usually cut the elastic only when I’m all the way around, overlapping the two ends and backstitching. You can fold one layer under to make the join neater, but it get’s a little bulky and unmanageable. Stretch the elastic slightly as you sew. The first step of attaching the picot elastic, the right side of the underwear seen in the foreground. 8. Turn the elastic back and under, so the elastic stays flat and the fabric folds under itself. On the right side zig-zag again, along the edge of the underwear fabric . Backstitch. 10. Look at that, you’re done! Well done! I would love to do this, I don’t have a suitable old T-shirt, but I can’t seem to find any appropriate material to buy – can you tell me what I should be looking for? thanks! Hi Katt! Most fabric stores will usually have a jersey section. I prefer a fabric that is mostly cotton for breatheability. You could probably just ask the salespeople for t-shirt appropriate fabric! Just keep in mind that thin fabric will be less hard wearing, and dense fabric might not bee very comfortable due to being to thick and not stretchy enough. Good luck! I know this is 3 years after you wrote this wonderful tutorial but I still want to thank you for the tutorial AND the link to buy the elastic. 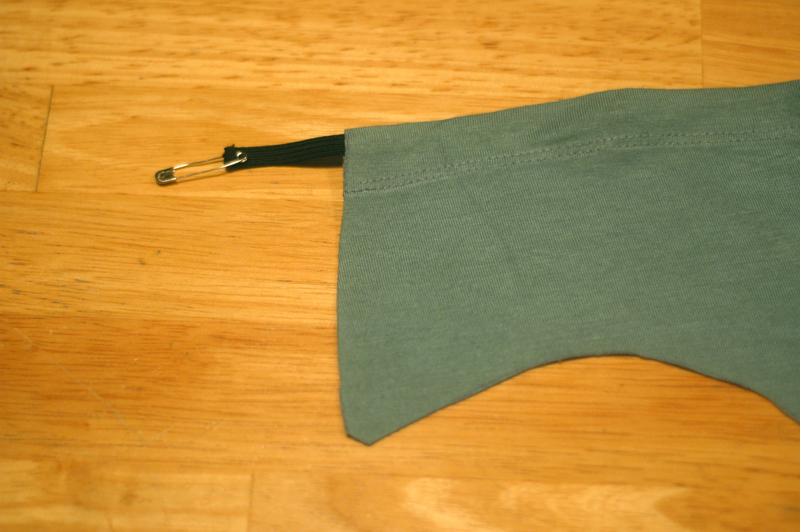 Now I’ve got a source for elastic that makes making my own undies economically feasible. . When attaching the elastic do you stretch it at all? I do stretch the elastic a bit when I sew. The elastic stretches more than the fabric does, and this varies between each type of elastic and each type of fabric. If you pull the elastic too much (or precut a too short length), you will get puckers and a tight leghole or waist. If you don’t stretch enough the elasticized seams will be wavy and waist that doesn’t hug you. I’m sorry I can’t give you an exact amount to stretch, but I’d guess that if you cut the elastic somewhere between 1/6th and 1/8th shorter than the length of the waist or leg-opening, you’d be in the right vicinity. I usually pull my elastic gently so I feel it gives a little, but not so much that it’s fighting me. Hi! I was so excited when I saw your pattern for these underwear! I dug right in, but I am have a bit of a problem (okay, a huge problem) with step no. 3. You say to “Roll up the front and back piece *into* the gussets, and line up the longer gusset edge and sew.” I can not for the life of me figure out how to line up the gusset with the back of the undies! There is just WAY too much fabric on the back piece, almost half more the amount needed if it is suppose to line up nicely together with the gusset the way the front piece did. I don’t want to gather the back piece make it fit, because that would be really uncomfortable. Can you please help me? Am I doing something wrong? I want so badly to make this work! Thanks! Hi Heather Joy! I’m glad you’re making a go at sewing underwear! The back piece and the back end of the gusset *should* line up, but inspecting the pattern I see that the back piece has grown too much in size, so you’re right – they do not fit together right now. I will have to edit the pattern and replace it, but in the meantime you can go ahead and trim the excess width of the back piece (equally on either side) to match the seamline length of the gusset piece. Sorry about this – thank you for alerting me! Okay, I’ll do that! :) Thanks so much for answering my question. Have a great day! Hi. How many pairs are you getting to a tshirt? Like an adult L tshirt USA. Cause underwear is like two-three dollars a pair, but if you’re only getting one pair out of a five dollar tshirt..
How many underwears you get out of a t-shirt depends a lot on the size of the t-shirt, the size of the underwear you’re making, and how much you’re willing to change things up. For example, I’ve made some t-shirts where the pieces got cut on the cross grain, instead of with the grain, so I could get more out of the t-shirt. I’ve also utilized the hem of the sleeve or the body as a “pre-made” casing for the elastic (it’s referenced in this post), and that can also help eek out as much as possible from the t-shirt. That said, my experience making a size Small underwear roughly indicates squeesing 2 pairs out of a medium women’s t-shirt, and probably something like 3-4 pairs from a large men’s size t-shirt. All my t-shirts sacrificed (!) for underwearmaking making have been either freebie t-shirts just taking up space, worn out, or shirts thrifted for a cool pattern or print. Thank you for the pattern and the tutorial! I made my first pair this evening. It will be exposed tomorrow blog post on my blog. Awesome pattern, thank you! I found another source for fold-over elastic, The Fabric Fairy has beautiful colors at great prices, $.40 to $.60 per yard. They also sell some beautiful jersey knits. I haven’t ordered from them yet but they look good. I recently ordered some skinny elastic and FOE from SKINNYELASTIC on Etsy – I think they’re a bit cheaper, but they might be comparable. Ah, great! It’s lovely to have these tips for different places to source FOE! Thanks Karla! No matter how many times I make these I always forget… when sandwiching the front piece between the two gusset pieces, should the front piece be right side up or down? Ooo, that’s a good question – and one that I have trouble with too, every time! Let’s see… the gusset are both facing the front piece with their right sides, so at this point (assuming the front piece is the first one you sew to the gussets), it doesn’t matter if the front piece faces up or down, since it will be mirrored by a right side gusset regardless. *However*, when you go to sew on the back piece, the right side of the back piece has to face the same gusset as the right side of the front piece is facing. In other words, as long as you sandwhich both the front and the back piece to face the same way (right side up *or* down), they will face a right side gusset, and you’ll be all set. I hope that clarified it, if not, let me know and I’ll draw up some illustrations! Hm… I thought it clarified it and put it together carefully but one of the pieces was still wrong side up! I didn’t worry about it though because it’s not obvious. For some reason, when I’m pinning it all together, I can’t visualize what it will look like when it’s unrolled! I found your tutorial easy to follow and understand. I am about to embark on my own undie making adventure and have one question about fold over elastic. Do you have to trim the edges of the seam allowance before using it ? My seam allowance is 6 mm. Hi Caroline! I’m so happy you’re finding the tutorials useful! You don’t have to trim the seam allowance, as the finished top edge is meant to be where the edge of the pattern piece is. If you were using regular elastic where you fold the fabric over several times, I would add to the seam allowance to account for what gets lost in the folding. But no, you shouldn’t have to trim the seam allowance. Of course, after the first pair, you might see some things you want to adjust in terms of fit, so I’m sure the pattern will keep evolving to suit you! Good luck! 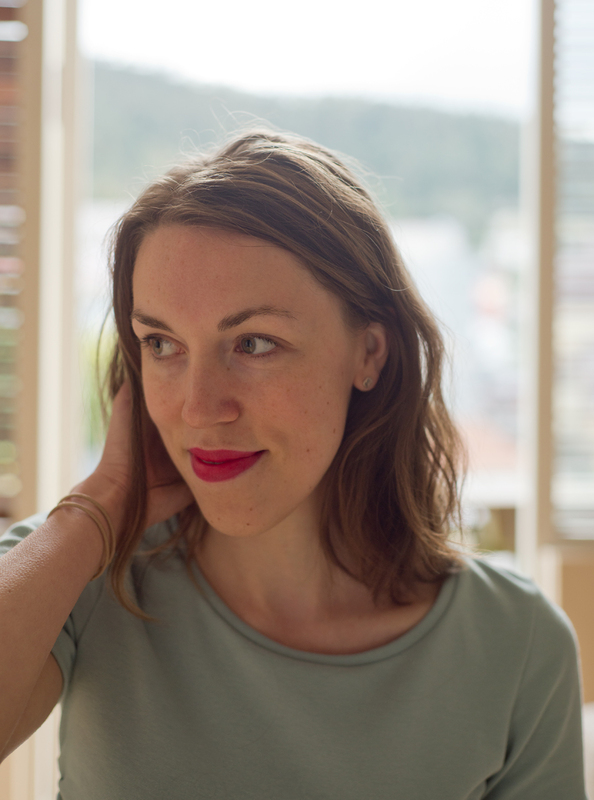 There are a couple of more tips in this post as well – I hope they can be helpful too! 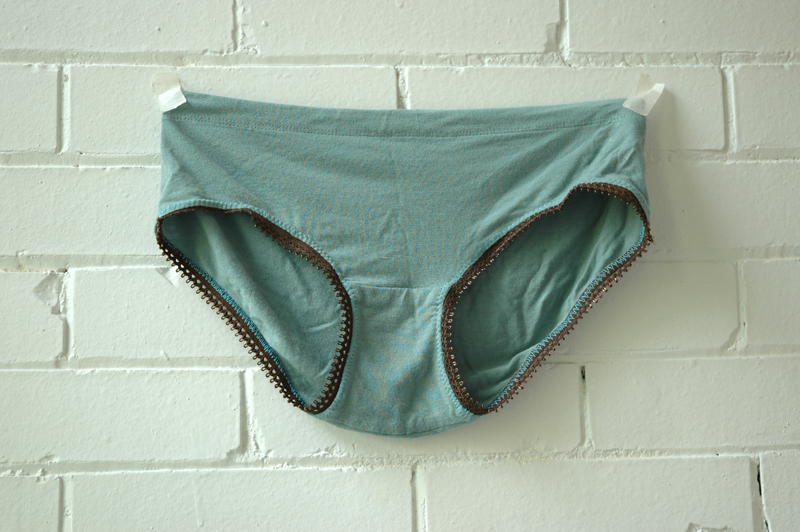 http://mumtopia.blogspot.co.uk/2012/10/typewriter-knickers.html Here’s my effort – typewriter knickers! Thanks for a fabulous pattern and tutorial. Hope you like them as much as I do! Oh, that’s perfect! I love it! You are a funny lady. Thank you so much for sharing, you had me laughing! 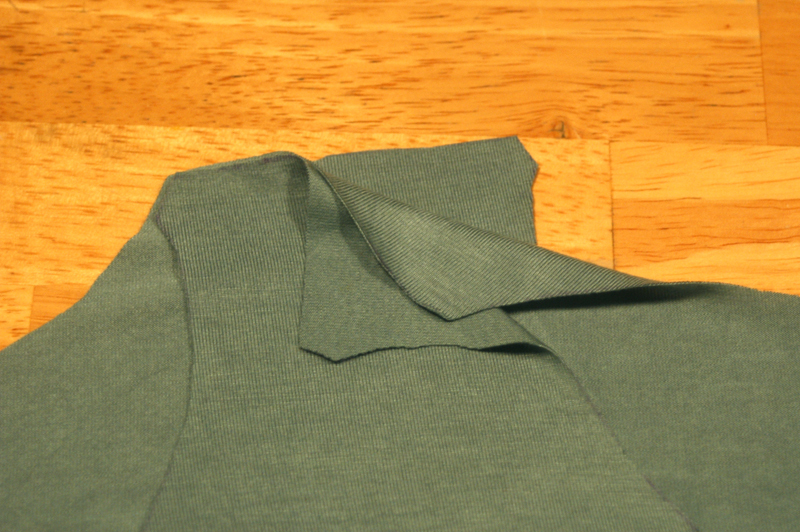 If you don’t use t-shirt material will folding the fabric over and making a seam mess up the pattern? Also… do you use a precut amount of elastic or just cut it after sewing it on? Thanks! 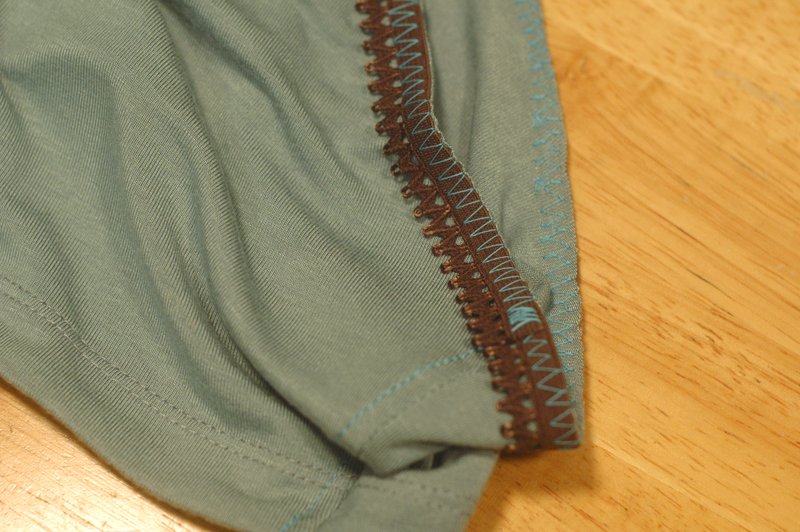 Folding the fabric over and making a seam will make the underwear lower rise. If you want to keep the original shape you can allow for a little extra fabric upwards, roughly an inch perhaps, depending on how much you fold over of course! As for the elastic, when I use elastic that is being sewn to the fabric, I just keep the roll of elastic in my lap as I sew, and cut after sewing it on. With elastic that is inserted in a folded over casing, I usually just hold the elastic around my waist where the underwear will sit, pull it until it’s snug but comfortable, and cut it to that length (adding a little for overlapping and stitching the elastic together). Everyone has their favorite ways of doing things, but this is how I do it at least. Hope that helps! Awesome tutorial! I can’t wait to give it a shot! Thanks for the resources, too!